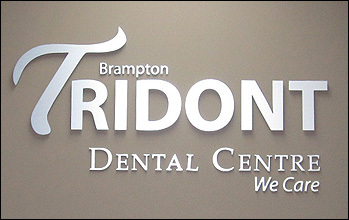 At Tridont Dental Centre, our general dentists, team of specialists, and supportive staff provide comprehensive dental care in Brampton. Our focus is sustaining the oral health of our patients, utilizing the latest in dental techniques and technology. Located inside the Shoppers World Brampton Mall, our Brampton dental practice addresses your oral health concerns before you run your errands. Every smile is unique and requires personalized dental care. Let our dental team provide the dental treatments your family needs. Contact our practice today to schedule a visit! Whether you’re a new or returning patient to our practice we provide a friendly atmosphere that ensures a comfortable visit. For new patients, we treat your specific dental emergency concerns first before delving into an in-depth consultation to get to know you and your oral health needs and goals. We take the time to discuss your oral health history and examine your smile. We take digital x-rays of your smile, which utilize less radiation than conventional x-rays. From these images, our Brampton dentists will then devise a treatment plan with recommended dental services to treat your smile. At Tridont Dental Centre, we welcome patients of all ages and cater to their specific needs. From kid-friendly dentistry, orthodontics, to teeth replacement, we have the services you need to restore your oral health. We are dedicated to provide patients a comfortable dental experience. At Tridont Dental Centre, we are fully staffed with an periodontist, orthodontist, and general dentists to offer patients comprehensive care. Our treatment philosophy is centered on conservative dentistry, with the goal of minimizing the need for extensive procedures by applying preventive care and patient education. We encourage patients to ask any questions about services to make informed choices for their oral health. Our comprehensive services target the specific needs of our patients. Paired with these treatments is our use of current technology. Our soft tissue lasers are effective, nearly painless tools that can alter gummy smiles or be used for grafting procedures. We emphasize a modern approach to dental care as part of our goal is to ensure oral health of patients. Visit our Brampton Dental Practice Today! Tridont Dental Centre offers of a team dentists and specialists in our practice, each with their own specific fields and interests including orthodontics, periodontics, and restorative treatments. All specialists are located in one convenient location so your family can receive care easily. For more information about our dental procedures, or to schedule a visit, contact us today.